This simple and delicious Thai chicken recipe is easy-to-make and tastes great. If you're a red meat lover, you can replace chicken with beef. There are different variants of Thai fried chicken and each one of them is capable of livening up your taste buds. This recipe is not of Thai origin but came from Sichuan province of China. The original recipe consisted of peanuts which have been replaced by cashew nuts. I've added prawns to enhance the flavor and to increase the number of servings. You're free to add your favorite seasonal veggies in this recipe. To get the best results, use a traditional wok and cook on a high flame. So here we start to quickly sizzle up this flavorful and hot fried chicken preparation. Savor this flavorful, hot, and spicy fried chicken recipe which is enriched with cashew nuts and select condiments giving it a unique and pungent aroma. Heat a cup of peanut oil in a nonstick frying pan. Dust chicken and prawns with a mix of rice and wheat flour. Keep aside for 5 minutes. Fry all the cashew nuts till they turn light golden brown and keep aside. Fry dried chili for 15 to 20 seconds and keep aside. Now add dusted chicken and prawns in the same oil and fry till they turn light golden brown. Keep aside. Take 2 tsp of oil from the pan and transfer it to a wok on a high flame. Add chopped garlic and stir fry for half a minute. Add chopped onion and toss for a minute. 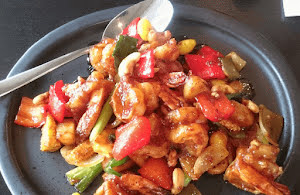 Add fried chicken, prawn, cashew nuts, red chilies, and red bell pepper. Toss for a few seconds and add oyster sauce, light soy sauce, fish sauce, and palm sugar. Toss and stir fry for a minute. Now add spring onion and boiled corn. Serve hot with a bowl of jasmine rice.